The new comet of the World Cup, Johannes Klaebo has invented a new style that's really worked well for him. It's a kind of running or jumping stride / herringbone. Notice how high he lifts the back ski. They say this way allows for max weight over the grip zone, and frequency can be increased as well. Looks both funny and cool at the same time, what do you think? Seems he is also working on new and improved techniques in the other styles as well. Last edited by Neuro on Sun Apr 30, 2017 9:52 am, edited 1 time in total. Seems logical to me. Most of us are probably runners anyhow so why not run on the skis? Yes, it is a both effective and funny looking technique. A diagonal stride without gliding. Cross-country skiing was originally called "skidlöpning" ("ski running") in Swedish, so this new(?) technique is back to the roots. Added another video to show it's used for herringbone and not just striding. 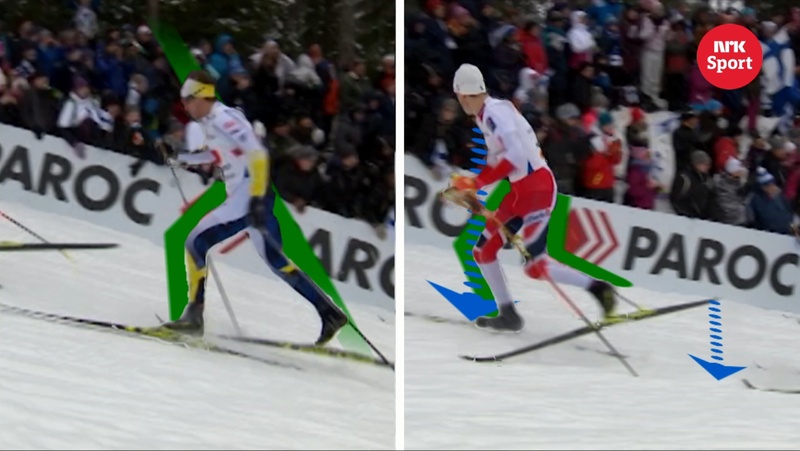 When you look at the original video, other skiers are doing something somewhat similar, except they don't lift the skis as much off the ground as Johannes Klaebo. Does it mean that skipping is a superior running technique that makes runner B run faster? Of course not. In skipping (same as in Klaebo technique) you lift your legs off the ground more than necessary for the forward propulsion. Runner B and Klaebo are running/skiing faster because they are (at least at that specific moment) noticeably fitter/stronger than their competition. No, pundits and trainers say this way is actually superior because the pressure on the grip zone is increased for better grip, and the angles of the leg enables him to start the push earlier. Well, let's wait and see then. This technique will likely be analyzed, and most importantly MEASURED during the off season. If it is superior to the current technique, we may see a lot of competitors adopting it for the 2017/18 races, otherwise, it will be just a flash in the pan. At the core, maybe one can see it like running without skis up a hill normally compared to dragging the feet low and waddling, herringbone style. Same for striding, but here with a gliding move. Maybe it's more tiring like you say, but they say faster. But then double poling has replaced a lot of double pole kick striding areas from before, despite it being more tiring, showing that it's the speed of the technique which counts. I doubt it will be a measure of its success if all start using it next season, as it's pretty specialized and against the grain of most, one would need a bigger time scale than that to say one way or the other. This is an interesting point. The new technique may indeed be faster, but at what cost? It's not clear if double-pole is indeed more tiring than kick double-pole, and if so, the difference is small. Hence, it was practical to adopt double-pole for the long distance races. This new "running" technique appears to be very high-energy, and may not be suitable for anything but short sprints uphill. The use cases for short sprints uphill are few, so this may not bring big changes to the sport such as double-poling . I note that sometimes in my video I do use the reasonably illegal DIAGONAL SKATING technique to show the difference b/w it and my wonderful striding gliding herringbone which is sadly illegal. To me it looks like Diagonal V, the lowest gear in the skating technique. If you edge the ski or not is not important from a competition judge's view point, I believe. As I said, I change between Diagonal Skating and Gliding Herringbone in the video. They are very different techniques. Gliding Herringbone, as I said, has zero skating involved. That is, there is ZERO glide during the kick. The ski stops and grips as per classic. In ALL skating there is glide during kicking. However, I agree there is no easy way to distinguish them so judges just lump this type of classic skiing in with skating. Thus they use the rule about skis can only glide in direction of travel, or the trail, or whatever it is, rather than the actual definition of classic which i think should be that the ski STOPS and grips to provide traction for glide-power. And so we lose this one aspect of classic from the need for easy judging and not because it's a skate. And so it's not legal for racing. However, it's fun and useful for all classic skiers. Last edited by JeffOYB on Fri Oct 06, 2017 7:34 am, edited 1 time in total. Klaebo's technique is not new. High School skiers have been doing it around here for years. MN Hoser wrote: Klaebo's technique is not new. High School skiers have been doing it around here for years. It's gotta start somewhere then break out. I just read how Siitonen was skating on the World Loppet circuit when Koch who was just visiting the scene noticed it and dialed it in further then brought it out to the World Cup scene. I'd think others were also noticing Siitonen at that time and copying him on the Loppets but it just didn't break out til Koch took it up to the premier level.